"From Territorial Days to Today"
As events leading up to World War II unfolded across the world, Alaska's Delegate to Congress, Anthony J. Dimond, urged Congress to bolster American defenses in Alaska, repeatedly noting the vulnerability of the Territory to attacks from Japan. Meanwhile, the Legislature continued to worry about the encroachment of Japanese fishermen on the waters of Bristol Bay and the Bering Sea, and asked the federal government to build more roads in the Territory. 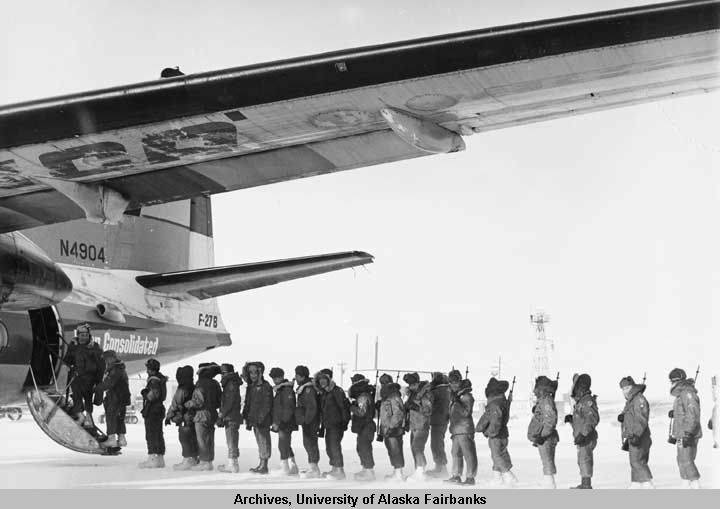 As the aviation industry continued to develop, the Legislature passed the Alaska Aeronautics Act, which created the Alaska Aeronautics and Communications Commission, and provided for extensive regulation of flight in the territory, including requirements for communications equipment in airplanes and ground stations. The federal Civil Aeronautics Act of 1938 would introduce further regulation to Alaska skies. Although a New Deal law guaranteeing the price of copper had briefly revived the Kennecott mine at McCarthy, it was on its last legs and would shut down for good in 1938, along with the Copper River and Northwestern Railroad which had provided transportation to the mine. In an effort to promote new mining operations, the Legislature created three public assay offices to help miners and prospectors. Mine safety was addressed with new requirements for ventilation, and sprinklers or other equipment to minimize airborne dust. The Legislature also established a mining license tax based on net income. The Legislature established compulsory school attendance for children ages seven to sixteen, and authorized school boards to require annual physical examination of students. Appropriations made to the University of Alaska included funds for a women's dormitory and the creation of an Agricultural Experiment Fur Farm at the university. The Legislature enacted comprehensive regulation of liquor, including new license requirements and taxes; passed extensive regulations for insurance companies; and created civil penalties for the pollution of water, air, or public or private premises by any person or business. In a 15-day extraordinary session to act upon provisions in the 1935 federal Social Security Act, the Legislature established a Department of Public Welfare and provided for the distribution of "old-age assistance" and unemployment compensation. The 13th Territorial Legislature included Alaska's first woman Legislator, Representative Nell Scott of Seldovia. The first Fur Rendezvous is held in Anchorage. The Hydaburg Cooperative Association ratifies Alaska's first Indian Reorganization Act constitution. The German dirigible Hindenburg crashes while trying to dock near New Jersey, killing 35 people. Orson Welles performs the radio drama "The War of the Worlds," convincing some listeners that Martians are invading Earth. Construction begins on a Navy air base on Sitka's Japonski Island. Japan invades China, beginning World War II in Asia. Germany and Austria unite in the 1938 Anschluss. Time Magazine names Adolf Hitler "Man of the Year" for 1938.